That weekend at the beach you’ve been looking forward to or the first day of school or a new job can be stressful times to have your period start, especially if your periods are painful. Wouldn’t it be nice on days like those not to have to worry about pads, tampons, or pain killers? If you use the pill or the ring for birth control, you are in luck—you can skip periods as you please. First, a few details about the pill. Many types of pill come in packs with 21 or 24 active pills—those are the ones that contain the hormones that make them effective birth control. The other 7 or 4 pills are placebos—they cause your period to start and are not part of what makes birth control pills effective. Some pills are monophasic, meaning they have the same mix of hormones each week in the active pills. Some are multiphasic, meaning that the mix of hormones changes from week to week in the active pills. Now, the details on how to control your periods. There are some brands of pills that come pre-packaged for skipping periods. But you don’t need those brands to skip periods like a pro. 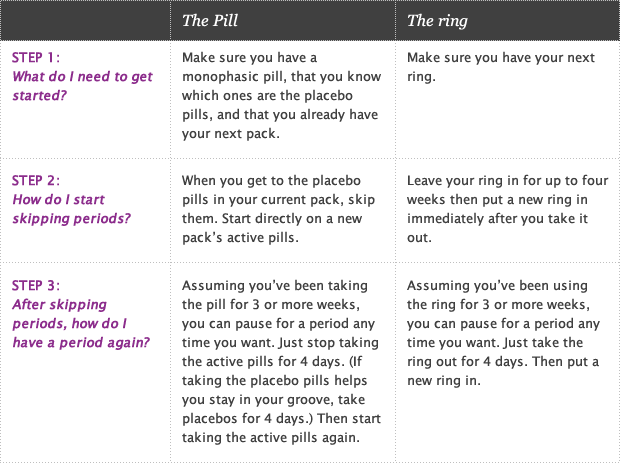 If you’re on the ring or any monophasic pill, you can control the timing of your periods. Sometimes skipping periods this way is described as continuous use or extended use—it’s all the same deal. Here’s how it works. Question: Aren’t women supposed to have a period every month? Am I hurting myself by skipping periods? Question: How long can I skip periods? Answer: It is safe to skip periods for as long as you want! It depends on what you are comfortable with and whether you have spotting. Spotting—a.k.a. breakthrough bleeding—is normal, and may just be a sign that your body is adjusting to continuous use of birth control. If you don’t like the spotting, you can have a period. You may be able to control spotting by having a period every 3-4 months. Question: If I use my birth control continuously, does that decrease how well it works at preventing pregnancy? Question: Why should my pill be monophasic if I want to skip periods? Answer: Monophasic pills cause less spotting than multiphasic pills when you take them continuously. Question: Will the ring really last for four weeks? Answer: Yep. The ring has enough hormone in it to effectively prevent pregnancy for 4 weeks, no extra steps needed to skip your period. Question: Besides getting to decide when I have my period, are there other perks to skipping periods with birth control? Answer: Probably. Studies that compared menstrual symptoms in women taking pills the traditional way and continuously found that those who take pills continuously have fewer headaches, genital irritation, tiredness, bloating, and menstrual pain. Hurray for fewer period symptoms! So yeah, birth control can be great protection against an accidental pregnancy, but it can also offer big benefits like having fewer periods and controlling when they start. If the pill or the ring aren’t for you and you want to have fewer or lighter periods, check out the hormonal IUDs, the implant, and the shot. As always, talk to your health care provider with any questions or concerns.